When it comes to comfortable concealed carry, look no further than the Model 032 Insider Holster from DeSantis. The holster eliminates unnecessary features and frivolous add-ons to offer the lowest profile possible for easier concealment. A durable, spring steel clip is integrated high on the holster's body, allowing it to be carried deeper in the pants for maximum discretion. The Insider is constructed from premium, softened leather for a secure fit that does not chafe or bruise the body. Seams are meticulously stitched and reinforced with military-grade thread to maximize service life. Great price and great product, second inside holster bought and I really like it. Will buy more. 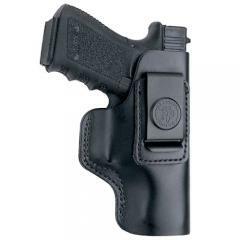 Nice holster at a great price, CopsPlus is great to deal with. Great holster with quality leather.